Birka and Hovgården are archeological sites that are a testimony to the wide-ranging trade network established by the Vikings. Birka was also important as the site of the first known Christian congregation in Sweden, founded in 831 by Saint Ansgar. The town Birka was founded in the 8th century, and was an important harbour until the 10th century AD. It is located on Björkö island. 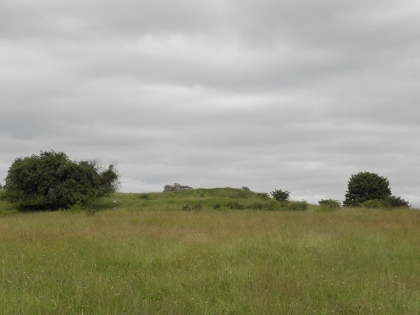 The site includes remains of a fortress, ramparts of a town wall, traces of harbours and thousands of burial mounds. Hovgården lies on the neighbouring island of Adelsö. It has both Viking and medieval remains, comprising of a church, a brick palace, several burial mounds and a harbour with a runic inscription. 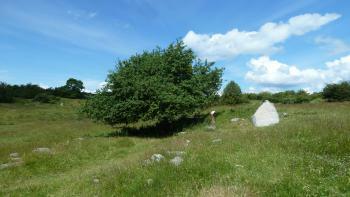 Hovgården is believed to have been the site from where kings and chieftains ruled the area. I only visited Hovgarden, which is located on the calm island of Adelsö. This can only be reached by a car ferry. The ferry runs every half hour all day, and even on a Saturday afternoon I found it wasn't too busy. The ride is free, as well as the entrance to the archaeological site. The Hovgarden part of this WHS comprises of a few rune stones, burial mounds and the remains of a palace (only part of a wall is still visible). They lie in the center of Hovgarden town. It's a nice stroll through the fields, and information is posted along the way. 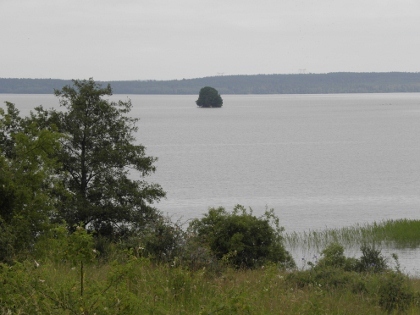 From on top of the hill where the palace stood, there are good views on the surrounding lake and to Björkö (for Birka). The walk ends at the medieval Adelsö Church, a lovely small romanesque construction. Inside there are runic stones too, but unfortunately I couldn't get in as a wedding service was going on. So after about an hour I ended my visit and took the ferry back. I visited this WHS in July 2018. The day before my visit, the boat which took me to Drottningholm was berthed next to another one which was fully packed with people (mostly children) heading to Birka. In the summer months, not only does the island of Birka and its museum cater mostly for children but they charge an arm and a leg for it (almost 50 euros for a return trip) in what seems like an overpriced tourist trap. For those who still want to visit Birka in the summer months, a cheaper alternative at around 30 euros is to catch the daily ferry at 11:30 from Hovgarden but you'll only be allowed slightly more than 3 hours as the ferry back to Hovgarden is at 14:45. Initially I had planned to cover both islands, Birka and Adelso, which is why I left Drottningholm for a separate visit (it's really easy to combine the palace with Hovgarden if you have a rental car), but after the noisy crowds I saw departing from Stockholm to Birka during my stay, I decided to call it a day after Hovgarden. After an early departure from Stockholm, I reached the free unmanned ferry point which departs every half hour and takes only a couple of minutes to get you and your car on the island of Adelso. Once you reach the island, brown signs with the unesco symbol show you the way to the Hovgarden church and burial mounds, together with several yellow signs with Vildsvin written. Visiting quite early in the morning, it only took a couple of metres to deduct what that meant - wild boars - which cross the country roads every now and then. Since I was not in any hurry, I decided to park my car in a small parking lot near some sports and fitness centre, a couple of hundred metres before the Hovgarden church and visitor centre. From here there is a walking trail, a UNESCO WHS plaque and some information boards in English. The trail is only visible at the beginning as the rest is literally a walk in a grass field with grazing cattle surrounded by the sea (and Birka in the background), a few trees, a pier, 2 hills (one of which has some remains of a brick building) which are not to be mistaken with 4 burial mounds, a church and cemetery, and of course the painted rune stone (photo - best light for photography is in the morning). More than a thousand years ago, a powerful demesne (a piece of land attached to a manor and retained by the owner for their own use) resided here. From Hovgarden, the Viking age king ruled over his demesne and the trading town of Birka. Declared as the descendant of the Nordic Aesir gods, he was also the highest ranking leader in the Aesir cult. He did not rule politically over the decisions of the law court, although he was its chief justice in matters of dispute. Activity at Birka ended in the late 900s, but Hovgarden continued to exist as part of the royal demesne, one of several royal manors belonging to the king. 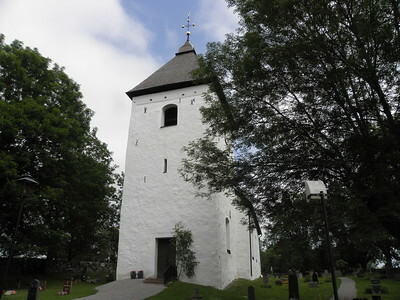 During the 12th century, the Hovgarden church was erected beside the ancient burial mounds. In the 1270s, the Swedish King Valdemar Birgersson began the building of a royal hall, Alsno Hus, a splendid brick building used only for official purposes (now in ruins and used as grazing land and a place to seek shade by the roaming cattle!). Around 1280, King Magnus Ladulas held an important meeting here, during which the foundations for the Swedish nobility were laid. Birka and Hovgarden's OUV is supposed to lie in the fact that the area is a preserved example of the Vikings' trading networks during the two centuries when they expanded economically and politically in Europe. However, not much is left to see and when compared to the Jelling Mounds or Trelleborg, the only plus points out of the visitor experience is that the rune stone is easier to see as it is not (yet) protected behind a glass like in Jelling. 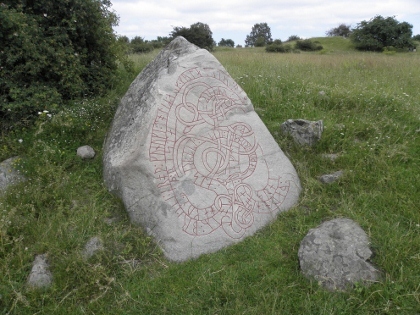 The rune stone inscription is painted in falu red so it is even easier to see and appreciate. 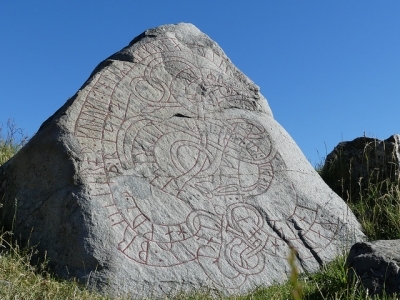 However, the design, size and inscription is not that significant compared to the rune stones and picture stones in Gotland Museum in Visby or the rune stones in Jelling. Nor are the 4 royal burial mounds of Hovgarden, three of which to the north of the church and the biggest one further on which is known as Skopintull, where the remains of two cremated persons were found together with remains of valuable objects and bones from hunted birds of prey which confirm that this was a royal grave. If the priest with the key to the church sacresty is around, you'll be able to see another two small rune stones in the wall which are even less spectacular. I have visited only Birka as a half day organized boat tour from Stockholm city hall pier. The trip itself was pretty nice but a bit too long – 2 hours one way. As there’s nothing to do on the boat, it is a good time to read or just enjoy the sunny weather – if it’s sunny of course. Birka is not a very big archaeological site and, as stated in other reviews, not many things to see – just hundreds of burial mounds and some stone walls rising just a metre or less from the ground. The small museum is included in the tour, although most of more interesting artefacts are displayed in the Swedish History Museum in Stockholm. We had a one hour guided tour around the island, and the guide was really great! We walked through the mounds and heard the story of Vikings, their everyday life and conquests, their rituals and beliefs. He gave us many info about what was excavated and found in the graves, how their defensive system looked like and what their feared. The tour ends at the rock with a cross commemorating German archbishop Ansgar who came here in 9th century to serve German traders living in Birka. As World Heritage Traveller I have visited over 250 UNESCO-sites in the world. But in my hometown there are also 3 sites to see, that tells the story of three historic periods in Swedens capital Stockholm. This film covers the viking town Birka that flourished between the 800s and the late 900s. As with many other reviewers here we visited only Hovgarden, which proved to be an enjoyable out of the way idyll, even if the actual remains weren't especially spectacular. After a quick free trip on the car ferry we headed to the site. Just in front of us was a guide in Viking dress conducting a tour in Swedish, we were too far away to hear anything, but it did highlight to us the route we should take around the grassy mounds. There were a few small boards dotted around to help interpret the green lumps and stones in front of us, but to be honest there wasn't really much to grab me. It was a nice stroll, especially when we got down to the waterfront and found there was a little boat going over to Birka, however the cost and amount of time required for the return boat quickly ruled it out. We had a quick look inside the church, which was everything you would expect from a small Scandinavian church; pleasant, calm acres of white surfaces. Then that was about it, we headed back to the small café/ library and sat in the mid-summer sun, trying to acquaint ourselves with the distinctly Nordic "treat" of salt liquorice ice cream. Then we headed off for a quick drive around the island whilst we killed time before the ferry arrived. It was a pleasant and idyllic way to spend a morning in the warm sunshine, however I don't feel that I really got much understanding of the value of the site. A trip over to Birka and its museum could hopefully provide a more thorough explanation however the large cost in terms of both money and time rather put us off making a visit. So we didn't see the best of the site but we had a nice morning, and the route back to Stockholm goes straight past Drottningholm so we had an enjoyable stroll around the gardens there to round out the visit. There is only a handful of WH sites associated with the Vikings, and the major reason for this seems to be that they just didn't leave that many traces. Their buildings were made of wood, so the major Viking remains are runestones and burial mounds. These are also what you can see in this site, spread over 2 islands in Lake Mälar, just outside Stockholm. Birka, on the island of Björkö, is only reachable by boat, and there is a daily excursion boat leaving from Stadshuset. The island includes a decent museum with many findings (although most are in Stockholm museums), and the guided tours take you to the major burial mounds and modern additions (a chapel and a large cross dedicated to St. Ansgar, who - unsuccessfully - tried to bring Christianity to Birka). Birka was a large trading post in its heyday, and one of only a handful of Viking-age cities. The king, however, resided in Hovgarden, on the island of Adelsö, just a short boat ride away. I wasn't really sure how to include this in my travel plans, but in the end, it was pretty easy. Just 30 minutes after the boat to Stockholm left, another boat made the trip to Adelsö, and I could explore the site on my own. 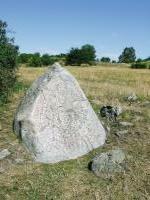 There are burial mounds there as well, plus a few scattered runestones, which I didn't see in Birka. So I think both islands are worth a visit, even if the bus trip from Adelsö back to Stockholm took over an hour. This is one of the few insights into authentic Viking life that one can get anywhere - and there is a realistic imitation of a Viking settlement close to the museum in Birka. I visited Hovgaden on Adelso Island by #312 bus from Brommaplan T-bana station. There is a daily ferry from Hovgaden to Birka, but as its departure is not co-ordinated with any bus arrival I didn't go there. From other's reports, I didn't miss much. I did see the island in the distance from the Hovgaden fortress site, and found some inscribed runic stones near the Adelso church. I first visited the Viking village of Birka and Hovgården on the small islands of Björkö and Adelsö in Lake Mälaren during a school excursion in 1969 when I was only 7 years old. And similar to later trips in my life I have always used the tourboats that departs from the Town Hall in central Stockholm to approach the islands, a journey that continues to be an immensely popular day-trip for both Swedes and foreigners, visiting Stockholm in the summer..
And summer it has to be, since it is only possible to visit Birka on the island of Björkö from June to August. During the winter you can still visit Hovgården through a quite complicated and time-consuming bus ride from Stockholm but don’t bother with this unless you are manically into Swedish Viking remains. Birka dates back to the 8th century when a Swedish King (name unknown) founded the city of Birka on the island Björkö. Foreign merchants made their way here from near and far and in its heydays more than 700 people lived and worked here. By the end of the 10th century, Birka’s position as trade center was taken over by nearby Sigtuna and Björkö was abandoned. The advice for the first time visitor is to keep your expectation low. Don’t expect to find a full-fledged Viking town on Björkö. The truth is rather that there are actually NO visible remains from the Viking age on either Birka or Hovgården apart from the thousands and thousands of burial mounds that are scattered all over the island. On Hovgården you can find some remains of a small fortress but this one dates back to the 11th century so it’s not really Viking-ish. So this is a true archeological site and if you want to see the most impressive remains found on the islands you should pay a visit to the Historic Museum in Stockholm. My last visit to Birka was in August of 2004 and I noticed that there have been quite some improvements out there. A new small museum and visitors centre has been built and the restaurant seems to have gone through quite an upgrade. You can participate in a number of guided tours (in Swedish & English) which is something that I strongly recommend – it’s good to have someone explain to you what was once what. Introduction of Christianity: The earliest known Christian congregation in Sweden was founded there in 831 by St Ansgar. A german monk (later to be canonized), he had gone there in 829 from Denmark, where he had been sent by the Emperor Louis the Pious to evangelize the Danes. His successful mission is recorded in the Vita Ansaari written shortly after his death in 865 by his successor, Rimbert. Cultural sites taking up an entire island: The map of this site in the AB review seems to show that the entire island of Bjorko is inscribed. 110 Community Members have visited.